V 36.13: Software Behavior Earlier and Now- Interesting Information! I can easily see changes in software and how it affects performance since I have a rather big apartment- 192 sqr meters (2067 sqr feet) in total. So if I remove the entrance, balcony, laundry room, 3 bathrooms, and 2 storerooms. Then we have bed platforms in three of the bedrooms- so that are additional areas that the robot doesn't need to clean. The robot reports that the area that is cleaned is 80 to 90 sqr meters. Same area but a different number of sqr meters are reported each time (interesting!) This area to clean is divided into 9 rooms. I have 1Gbps fiber optics internet connection and the WiFi system I am using is Netgear Orbi RBR50- 1 base station and 3 satellites, covers the whole apartment and no weak signal spots. We have hardwood flooring in all rooms and no carpets. I bought the PUREi9 on the 10th of November last year and it worked rather well! But I quickly realized that the cleaning was NOT done in a smart organized way but more of a non-logical way! It starts with one room and before that room is completely cleaned it leaves for another room. Then wasting battery power by later coming back to the rooms which still have small patches left to clean. But I was not concerned about it since the robot cleaned the apartment in two rounds- so only one recharge. But recently the behavior of the robot has drastically changed! Since there is a bug in the App software I can't check when the last software upgrade happened, but now I have version 36.13. Sorry, but let me be honest and straight forward here. Version 36.13 is a nightmare and my robot has totally "changed its personality" and I can hardly believe this is the same robot vacuum cleaner I bought 5 months ago!!! First of all, I only get about 1 good (good, but not great!) cleaning out of 4- 5 cleanings. The robot goes from room to room without actually finishing any of the rooms. Then wasting battery power by going back to clean small leftover spots in rooms which are up to 15 meters away! It now also frequently bounces off the furniture and try to go under places which didn't try earlier. So the plastics are all scratched up. My apartment can, as we have seen earlier, get properly cleaned in 2 rounds- one recharge. But now it can go on from early morning to evening and still can't finish the apartment! The record at the moment is 5 recharges!!! After that, we just stopped the robot's "crazy cleaning tour"! 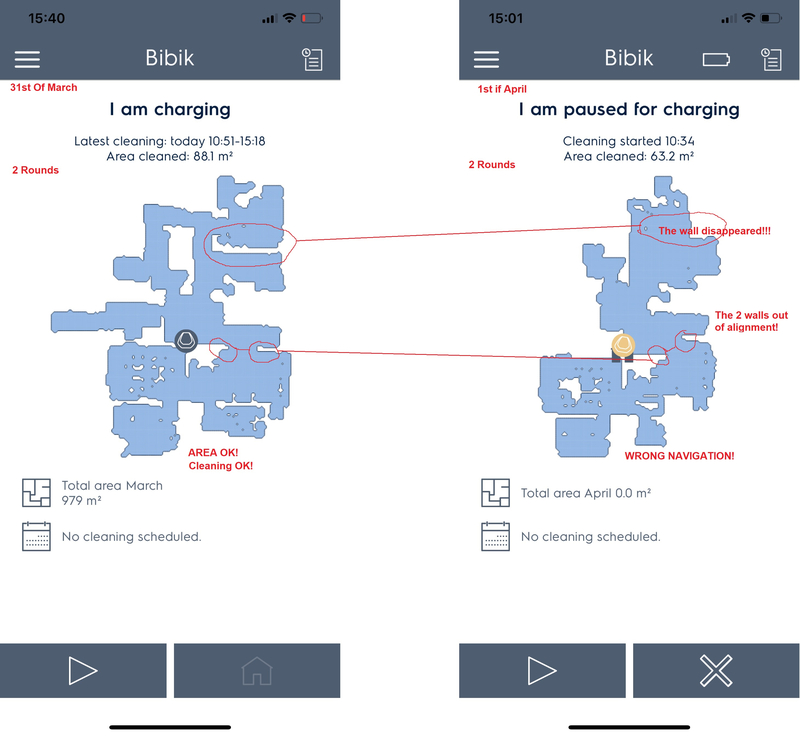 Then when I checked the status between each recharge I realized that the robot could spend one whole battery charge on cleaning less than 1 sqr meter up to only 5- 6 sqr meters!!! Something is obviously seriously wrong with the navigation system! Then yesterday what should never happen did for sure happen- the robot fell down the staircase to our entrance area!!! So there is no question about it- the current software is a low-performance navigation system and in my personal opinion rather useless. I sincerely hope that you guys at Electrolux realize that by releasing buggy low-performance software upgrades, you are slowly but very effectively killing the sales of your PUREi9!!! First of all, I have seen several reviews online which highlights your robot's strange navigation behavior. Then I personally had to protect myself and call around to the people I recommended to buy PUREi9 to tell them to hold on for a while and not buy now! Otherwise, they will blame me for buying a "crazy robot"! You have a great product (mechanically only at this moment) which has gone from great to bad because of software updates which has step by step lowered the performance to unacceptable levels. If you could get your internal software upgrade process in order and start to release software upgrades which each time increases the performance of the PUREi9, I gurantee that you will soon find Electrolux in a Google Search for "the best robot vacuum cleaner". P.S. I have a 9 minutes long video of PUREi9 bouncing back and forth between the legs of a chair, footstool and a table, totally lost, before it finally finds its way home. I can send it to you if you need? You're right about the cleaning order not being "perfect". We intentionally go back and forth a bit, based on the idea that it will help the robot keep better track of its position by revisiting earlier areas. However, it will not cross a threshold until it's cleaned all the area on its current side - but I assume you do not have any, or that they are quite low? Maybe we should look into detecting doorways, but it's a bit complex. If the robot gets lost, it can spend time trying to reach an area that is now inside a wall. Here we for sure need to spend time detecting when this has happened, and marking larger areas as unreachable. We're currently working on functionality that will let the robot reuse information between runs. This should help for your case. Not ready for release just yet, but expect it later this year. This will both improve the localization and also the cleaning areas, trying to merge smaller ones into their neighbours. Do note also that it tends to be the people unhappy with a product that write online - the ones that like the performance will usually not write about it. Not invalidating your experience, of course! Thank you for your reply! But you offer no reason or solution to why my PUREi9 that has cleaned the apartment properly for 4 months, or so, now behaves totally different. Not able to do the cleaning in 2 rounds as earlier, but now instead takes 4- 5 rounds and why it spends one whole battery recharge on cleaning less than 1 sqr meter up to only 5- 6 sqr meters??? I was told by Electrolux Stockholm that maybe my unit needs to be re-calibrated. But I am not so sure that's the problem. Because there is a way to make my robot clean the apartment properly again! I have tried it now for 3 days and every time it has cleaned the whole apartment in 2 rounds and can find its way back to recharge. The area cleaned has been reported as: 91.9, 91.3 and 92 sqr meters. Sounds just right to me. No funky behavior other then the ordinary quirks. So would the robot be able to do this if it needs to be calibrated? If it needs calibration, they can't do it here in Singapore. So hopefully that's not the problem and I don't think it is. Saying that to get these normal cleanings the trick is to reset the unit after each full cleaning! If I don't reset the unit after each cleaning, only the first cleaning will be normal and then the 2nd, 3rd etc will be the type of crazy cleanings I described above. So if I have to reset the unit after each cleaning to get it to clean in a normal way, to me that could indicate that the unit already saves data but that there is a bug in the software when merging it. Please obvserve that I have a cleaning area of about 92 sqr meters covering 9 rooms. So if there is any navigation bug, the error will be muliplied the bigger the cleaning area is. My 2 cents worth. P.S. I have only 1 threshold and that is to the kitchen, which is always the last area it goes through. By resetting, you mean long pressing the play button until it displays off/pulling the batteries? Do you reset it just before starting the robot again, or at some more or less random time in-between? That is quite an interesting find. The actual navigation application will always restart in-between cleanings. It will save some information, but that will be saved to the persistent storage, so you as a regular customer should not be able to clear it. Of course there is also some state in the other applications, but it should not matter affect the navigation - not saying that there cannot be bugs in it. By the way, what is your experience with the smart phone app? Is it slow to update the live map? Does the robot's performance get better if you do not have the smart phone connected to the local wifi? Some other users have had problems related to the local app connection. Yes, you're right - I didn't offer much of a fix besides "wait for the next release". It is hard to troubleshoot these kind of issues. I really appreciate the information you provide. After pressing the Start Button until the Robot Shows "Off" and restarting it, the Robot sometimes becomes a new machine and acts a lot smarter then before restarting it. In the morning, before I run the PUREi9, I press the On/Off button for a longer time until the until goes Off. Then I take it off the charger station and empty the dirt from the last cleaning. Then I put it back in the charger station and it will switch on. Now I press the On button to get the cleaning started. Something obviously happens by resetting the unit, since I can finally get my apartment cleaned! And now we have one confirmation from Worka that we are on to something! Thank you Worka! My experience with the smartphone app is that it's buggy and very slow to update. I have no problem with connectivity, it's just way too slow to update the live map to make it useful so I don't use the App while cleaning. Then I am willing to test anything you need to be tested since 9 rooms covering 92 sqr meters is the perfect testing ground. Because I want to have a normal effective PUREi9 robot which I don't need to babysit. So please let me know if there is anything I can do! @BJW, what if you kill the app on your phone, so it is not running? Will the robot survive multiple runs, as long as you keep the app closed? Also, what if you onboard it and deliberately give the wrong password for the wifi, so it cannot connect - does this help? Another option is also to disable wifi, as per the instructions on http://www.electrolux.com/rvc-supplementary. This leads to the robot going into a deeper sleep mode though, kind of like restarting it using the long press. Information like this (Disabling WiFi or Switching the Robot off) schould be published in the users manual! Not on any website that you can't find anyway if you don't know it. It's a shame to have to mention such a matter of course at all. The link can be found at the very back of the manual. It's not very detailed, though. But you're right, we could've mentioned all this in the manual. Not sure if all the options were in the first release, though. For example the long press for turning off the robot was implemented later, I think. Disabling the Robot worked that way all the time i own my Robot. I bought my Robot in 2017 and had to turn it off and on to fix a WLAN Connection Issue. I had to call the Support because I did not know how to turn it off. I will test all the options you gave, starting with disabling the WiFi. The weekend is coming up, so I should have some results by next week. I tried to switch off the PureI9 and it cleaned for 1 day- 2 rounds. The next day it gave E30 error message and it doesn't matter what I do I can't get the unit to start and get the WiFi on again! Now when I press On to clean the time display goes blank and nothing happens. Then I press on again and the time display is back on. I really need to clean the apartment so how do I get it on with WiFi again? When the screen is on, showing either dash or a time, can you not use the "long press home, long press eco" to enter the hidden menu? If it keeps showing E30 after you reboot it, something has gone very wrong with the internal state of the robot. Does it pop up as a mass storage device if you plug in the USB cable? Then we can recover it. What happens if you press play? Does robot just restart and show E30 again? Yes, I can get to the LAN menu and it shows its "ON" but no WiFi icon and no wireless LAN. E30 shows whatever I do including switching it OFF. When pressing Play it just switch between blank display and dashes now. The USB port is also dead! So just go to the service center then? The problem is that it will take weeks for me to get it back, and that will not work for me. Yes, I think the navigation board is not booting properly. This board is responsible for the wifi/cloud connection and the USB mass storage, in addition to running the structured cleaning. I'm very sorry, but there is not much I can do. Not sure why this has happened. It should not be because of the wifi off thing. Not something normally see - if you pull the batteries a lot, you might've killed the robot at an unfortunate time. My only answer is that you have to send it in for service.